Here’s a toast to Sketchbook Skool! In July, 2014 I signed up for Sketchbook Skool – an online course in honing your sketchbook/journalling skills. I have been telling people for years that I don’t draw. I can’t draw. I am crap at drawing. I prefer to paint… bla bla bla. My bestie in Canada, Lesley, had been doing the Kourse earlier in the year and I was watching and drooling over the stuff she was creating and posting on Facebook. I relented and bought a Moleskine and a couple of other sketchbooks and so my journey began. Now guess what? I DO draw, I CAN draw, I am PRETTY GOOD at drawing… I LOVE to draw and painting can still up there as well! And what is more, I have been part and privy to a community of people all over the world who also chose to discover a bit about life with a pen and a piece of paper. It is so good! I am so grateful to have found out about Sketchbook Skool and all the amazing teachers that have opened their sketchbooks and doors to the eager global students. 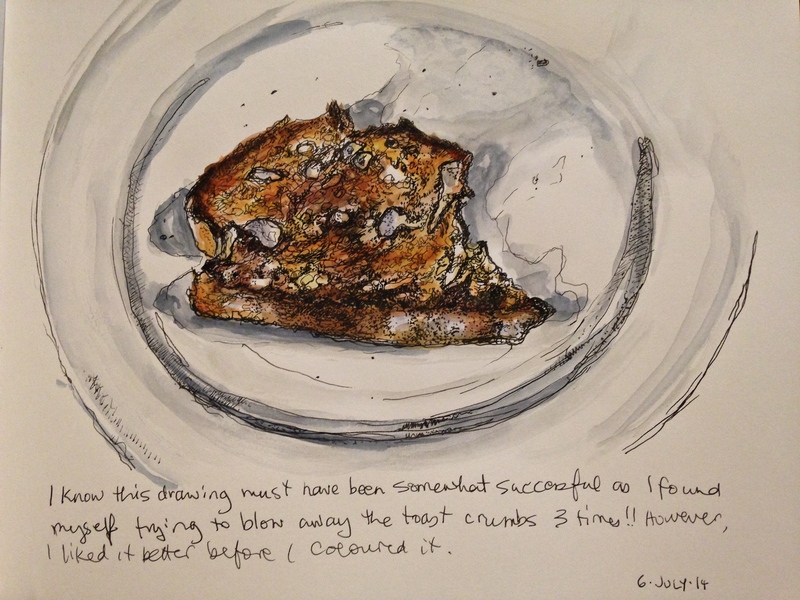 My first assignment in the “Seeing” Klass was to stare long and hard at a piece of toast and draw that sucker! I think I was lost on the surface of that thing for a good 2 hours, then I hesitantly added some colour to it. The jury is out as to whether it looked better without the colour, but done is done.